With less than 100 days until the start of the Winter Olympic Games in Sochi, organizers of the event have managed to show an Olympic venue that is completely or almost completely ready. But one question still remains: What will become of the multimillion-dollar complexes after all the games finish? Five months ago, only off-road vehicles were capable of reaching the ski jump ramps in Sochi. Springs were running down the mountains, the mud was impassable, and one could hardly believe that the construction itself was sustainable. Today, with less than 100 days before the beginning of the Olympic Games, there are signs that the event venues are ready to go. There is a road where there once was only dirt, and engineers have managed to channel the springs on the slopes. The construction of the Olympic venues and resort has come under constant scrutiny, with the first managers, the Bilalov brothers, criticized by the Kremlin for mismanagement and now facing criminal prosecution. They were replaced by Sberbank managers, who were able to get the construction back on track. Readiness: The assembly of massive metal constructions of the dome, which will host the opening and closing ceremonies, has been completed. It is told privately that the largest part of the ceremony will be performed in the air, and not on the floor. Future: It was officially declared that this stadium will serve as a training center for the national football team of Russia, and that matches of the 2018 FIFA World Cup will be held there. This is not, however, enough to guarantee consistent use of the venue. Spectacular events need to be held there, and it is not obligatory that these events are related to sports. This is why it is probable that the temporary roof won’t be disassembled: it will not affect football negatively, and it will be useful for organizing future events. Readiness: Completely ready. The first testing international competition — the Ice Hockey U18 World Championship — were held in April. Future: The ice rink will become a multifunctional sports center. A hockey club for the Kontinental Hockey League is being prepared in the region. Readiness: Ready. The palace held test international competitions in December 2012 with the Final of the Grand Prix of Figure Skating under the auspices of the International Skating Union (ISU), and in February 2013, with the Short Track World Cup. Future: The palace is going to be redesigned into a cycle race track and will be used for holding trainings and cycle race competitions. Readiness: Ready. The first international test competition — the 2013 World Single Distance Speed Skating Championships — took place in March. Future: The arena will become the largest exhibition center in the southern Russia. Readiness: The Olympic village occupies 72 hectares and is completely built. The planting of greenery is being completed, as well as the development of a pedestrian promenade (from one river to another) along the seashore with beaches and marinas for yachts. Future: The village is going to be transformed into apartments and sold, with the average price now around 150 thousand rubles per square meter. Readiness: The last remaining roof leakages that were caused by changes of the engineering design have been repaired. The design had to be modified because the Olympic Committee and the builders needed to place a vast amount of very complex equipment on the roof. The only thing remaining to be done is to lay the floors in some premises after all the equipment is brought in. 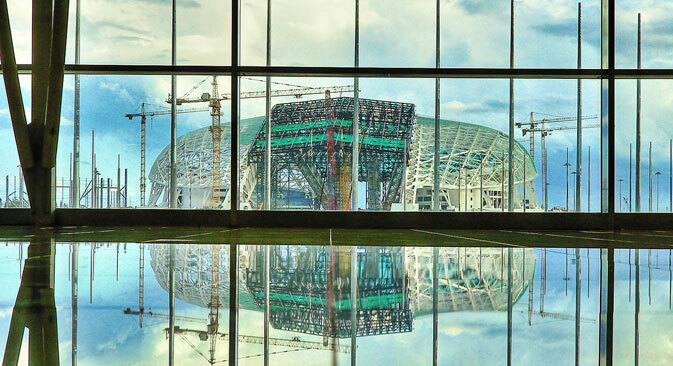 Future: The Media Center is so large that it could host even a Hadron Collider, but after the Olympics it is planned to establish a large shopping and recreation center with a hotel.